(A) siRNAs are double-stranded RNAs approximately 20 base-pairs in length. The duplex shown has staggered ends capped with two thymidines to improve resistance to digestion by nucleases. This is a traditional design, but it is possible to have blunt-ended duplexes, and the thymidines can be omitted. (B) Duplex siRNAs enter cells and bind to the RISC. The RISC proteins unravel the duplex and facilitate the search for mRNA sequences that are complementary to one of the RNA strands. 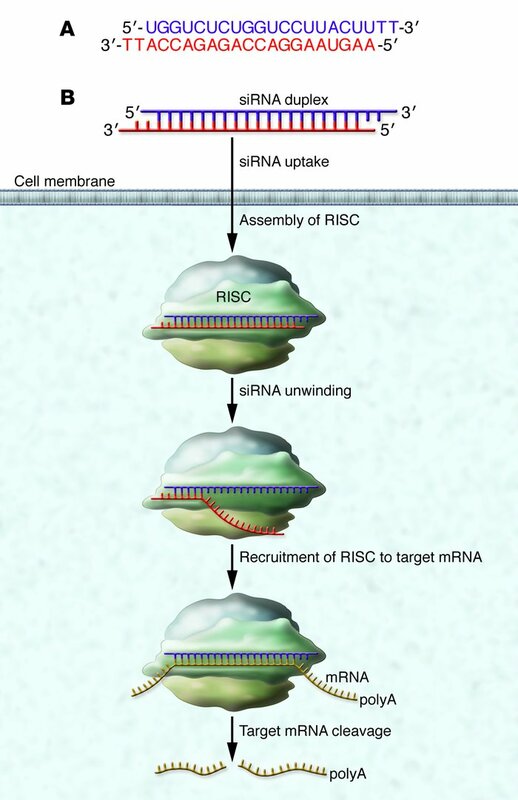 Upon recognition of a complementary mRNA, RISC cleaves the mRNA and prevents translation.